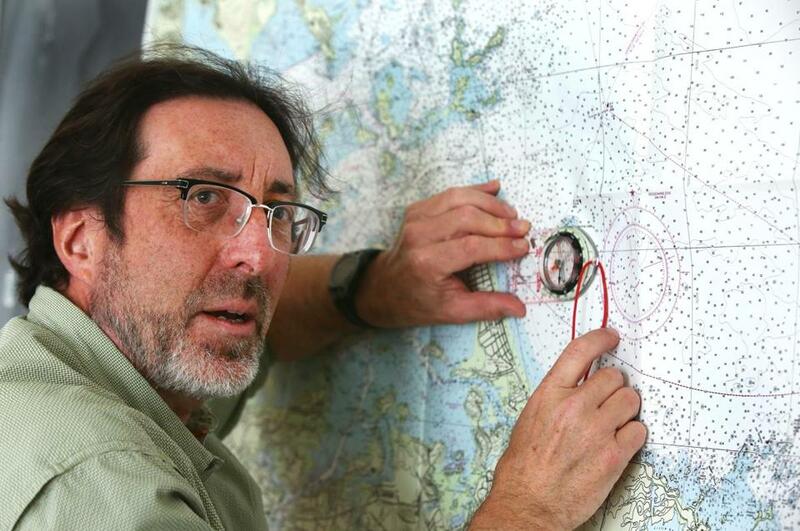 Harvard physics professor John Huth studies a chart of Outer Boston Harbor, using a backpacker’s compass. Harvard professor John Huth is a particle physicist. He was on the international team that discovered the Higgs boson, an event he blogged about in the manner of Mark Twain. The author of “The Lost Art of Finding Our Way,” whose love for the outdoors takes him to remote places, spoke to The Download about his digital habits. What object of technology would you feel lost without? My wristwatch. I have a tight schedule at work. I do a lot of video-conferencing to CERN in Geneva. My watch and my e-calendar help me keep track of my appointments across multiple time zones. What are some tech tools you’d take on a backpacking trip? I’m mostly a map-and-compass guy. I find Hi-Def Radar, an app, which gives me a radar image of weather conditions, useful. No one wants to be on an exposed ridge in a thunderstorm. Sometimes I use a satellite tracker, SPOT Gen3, which broadcasts my GPS coordinates to let people know I’m safe. It also has an SOS feature. Sea kayaking carries more risks than hiking and demands more backups. One “must have” is a waterproof VHF transceiver which allows me to alert boats when I’m crossing a busy channel, especially in foggy weather. I use celestial bodies in the night sky to orient myself. I have the positions of stars memorized. I consult Neave, an online planetarium, to see where the planets – they do tend to wander -- are in relation to the constellations. Recently, you monitored the progress of a canoer from Marshall Islands who took navigational cues from nature. The voyage itself went from the atoll of Majuro, where the capital of the Marshall Islands is located, to an atoll to the north, Aur, which is about 150 miles away across a fairly rough channel. We used a Garmin ForeTrex waterproof GPS to document where we were and also to compare notes with the native navigator. As it turns out, he was amazingly correct in figuring out our location, without the use of any electronics. If things had gone horribly wrong we probably would have gone to the GPS to make landfall. Fortunately, this didn’t happen. We also had gadgets to trigger a search-and-rescue operation if anyone fell overboard. In general, you don’t use GPS much? I’d rather use a map. I don’t mind getting lost. I enjoy asking for directions. Interactions with the environment and people are fuller when we eliminate too much high-tech.